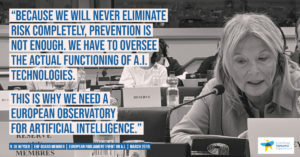 Brussels, 19 March 2019 The European Humanist Federation called for the creation of a European Observatory for Artificial Intelligence at the conference Artificial intelligence: Ethical concerns organized by the European Parliament as part of its regular dialogue with churches and non-confessional organizations under article 17 TFEU. Reaping the economic benefits of Artificial Intelligence (AI) and the underlying technology-driven race should not undermine methodical evaluation, classification, contingency and control of the societal risks posed by AI. The very nature of AI technology makes the expectation of “risk zero” unrealistic. Therefore, society has to reflect on the level of technology-induced risk that it is ready to accept. New technologies offer formidable hope to address some of the most difficult challenges faced by the world today. However, by using them, we are also building a society in which risk is increasingly present. The main question today is not only how to prevent technology-induced risks but also how to manage them. The EU has decades-long experience in this domain that should be applied to artificial intelligence. , said Véronique De Keyser, former MEP, Board Member of the European Humanist Federation and a specialist in Cognitive Engineering and Human Reliability. While it is clear that prevention should underpin the development of new technologies at every step of the value chain, including by consulting representative user constituencies from the design stage all the way to actual deployment, it is also at least as fundamental to acknowledge that shortcomings can be detected after deployment. Because we will never be able to eliminate risks completely, it is of utmost importance to complement prevention with control by society of the actual functioning of these technologies. This means efficient feedback loops, incident management and clear ways for users to seek redress. This is why we propose the creation of a European Observatory for Artificial Intelligence. This agency would implement societal control over AI and contribute to improving public understanding and debate concerning the applications of this booming technology. Such an Observatory would allow Europe to embrace AI in a responsible way, measure its benefits and risks against objective, impartial and widely debated criteria. Ultimately, it would contribute to reflecting on the kind of society we aspire to nurture: one based on emancipation and public debate or one where we are dominated by market forces, technology and the interests of those that develop them? For more information on the topic, please download our memorandum for the European elections and our contribution to the consultation organised by the Commission High Level Group on AI.